Omaha’s Henry Doorly Zoo is one of the nation’s largest and most respected parks with over 160 acres of animal enclosures. Trip Advisor ranked the zoo the “world’s best” in 2014 and US News and World Reports ranked it second to the St. Louis Zoo in 2018. With over 25 million annual visitors ticket sales can become crowded and overwhelmed easily. Therefore Omaha needed an efficient online ticket application that could handle the sheer volume of visitors each day. An user focused Heroku based checkout was selected in order to get people out of lines. and in the park. Omaha’s increasing popularity has pushed crowd levels at its main entrance to a new high. 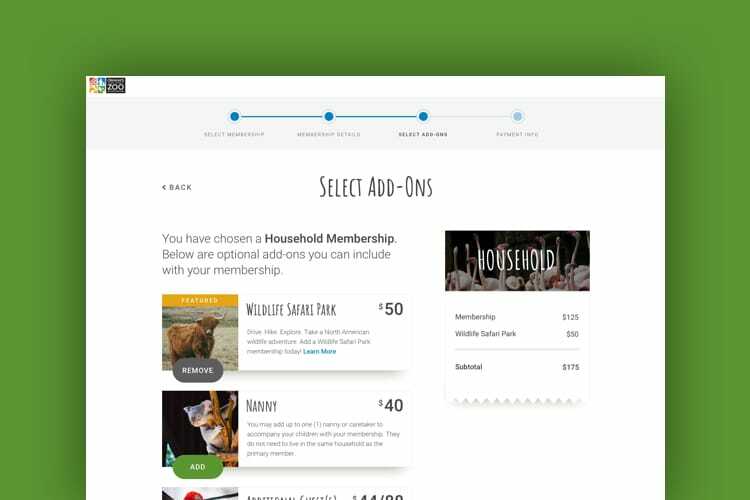 In an attempt to remedy long wait times and encourage customers to upgrade to zoo memberships, Omaha wanted an online application to easily allow patrons to buy tickets. This application needed to be user centered, allowing a customer to get from homepage to checkout as quickly as possible. We met with the Omaha team to understand how they could better serve their expanding customer base. 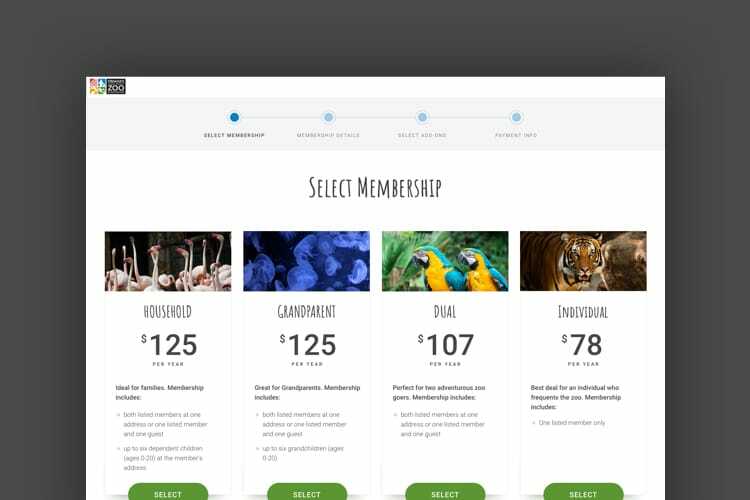 Creating an online checkout that lowered wait times and encouraged membership signups would allow zoo staff to focus on helping inside the gate rather than managing lines outside. Once we had a solid understanding of the checkout, we kicked off the design process by working closely with their team to wireframe out the flows. The conversational tone, breakdown of the long purchase process, subtle animations, and highlighting a user’s progress were all strategic decisions we implemented since are proven to increase conversions. In terms of visual design, the checkout was designed in a flexible way to allow for white labelling so we can include their logo and brand colors to give their users a more a seamless experience. 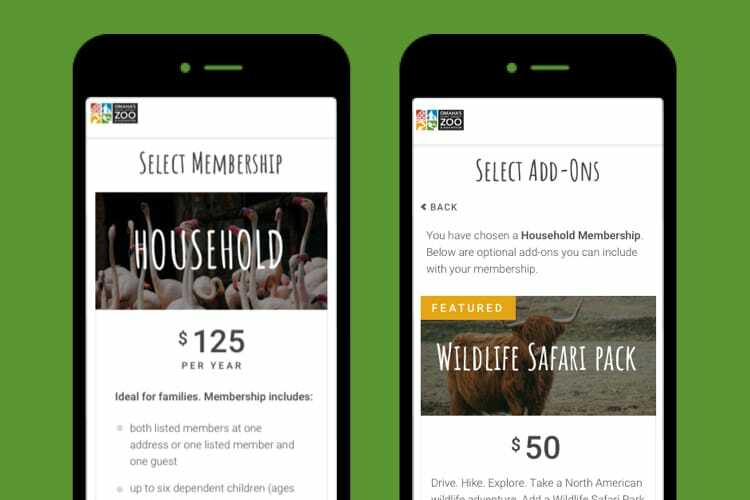 Zoo staff were excited to continue the theme of their recently redesigned website over to the checkout. Built with custom components through Heroku, a lightweight cloud platform as a service, that allowed us to create a dynamic and interactive checkout application experience, Omaha’s application greatly simplified the ticket buying process. Integration with an API allowed Omaha to detail every ticket and membership option in an easy and understandable way. Omaha’s ticket application even deployed in the busiest part of their year! 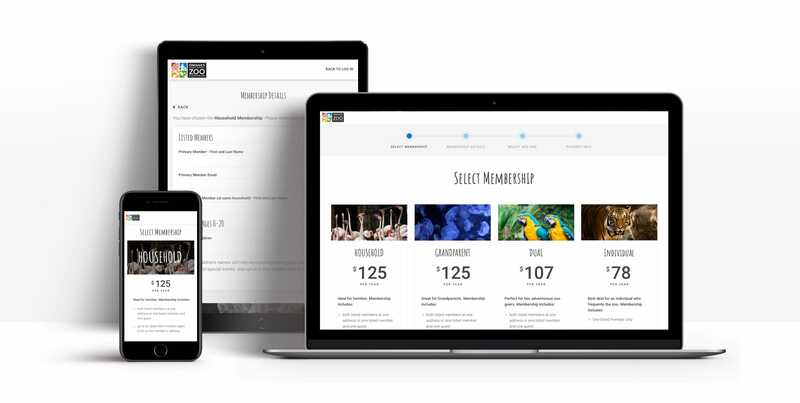 Customers immediately have the option to select what kind of ticket they want, which was separated out from membership purchases. After determining that clients struggled to create logins in the old checkout system, the new heroku model would only require members to login. Converts customers, by pointing out how close they are to finishing the checkout process. Allows individuals the ability to quickly add rides and attractions to their base tickets.